The sweetness of strawberries intensifies when they are baked in a pie. 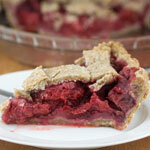 This low sugar strawberry pie has no added sugar, and the crust is made with whole wheat flour. I've never liked the overly-sweet, jammy taste of most commercially made pies. But I do love pies made from fresh, ripe fruit that contains little or no added sugar, which allows the taste of the fruit to shine through, and not just the taste of the sugar. Today is the first day of summer, and although we don't have local strawberries available in the grocery stores yet, I really wanted to make something summery. Although not as sweet and flavourful as local berries, the ones I found did make a delicious pie. You can weave a lattice top for a fancy looking pie like I did here, or you can simply lay the top crust over the pie and cut vents into it for the steam to escape. In a large bowl, toss the strawberries with the cornstarch and salt. Roll out half of the pie dough into a 10 inch round. Line the bottom of a pie pan with the pastry. Set aside. Pour the strawberry mixture into the pie pan and distribute evenly in the pan. Roll out the other dough half, cut strips and weave into a lattice top. See instructions. Or if you prefer, simply place the rolled out dough over the top of the pie and cut 5 or 6 vents in the top for the steam to escape. Fold the bottom crust over the lattice strips (or top crust) and press together with your fingers or a fork. Bake for 20 minutes at 400 F, then reduce the heat to 350 F and bake for another hour, or until top is golden brown and filling is bubbling. For a sweeter pie, add 1/4 cup sugar to the strawberry mixture in step 2.